Uncle Nikola bragged that this mechanical oscillator "Could Destroy Empire State Building with Five Pounds of Air Pressure." (NY World Telegraph, 1935). Unfortunately, his Earthquake Generator was never constructed. 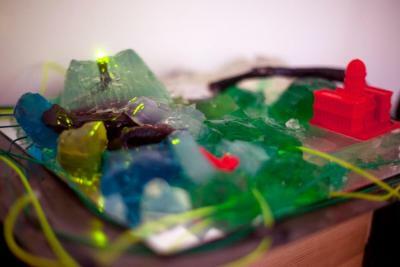 Perhaps WE can envision it by applying electronic oscillators to the ground of a city made of Jello. Why Jello? Have you ever seen a Jello City? It would be so jiggly.